Finally. We made keto brownies. You're not the only one who's been waiting. I've gone through test batch after test batch trying to find the perfect keto brownie recipe. I've tried many packaged ones also and nothing really delivered like true brownies. Until, I made these Keto Brownies. I cannot tell you how many times a day I think about these. Nothing stands in the way of my love for these, not even Matt. Add eyrthritol, eggs, vanilla and mix with a hand mixer. Mix until the volume of the mixture has tripled in size. This should take about 3-5 minutes on high. In a 3rd bowl, melt together butter and bakers chocolate. This can be done using a double boiler method, or by repeatedly microwaving for 20s and mixing. If using the microwave be careful not to burn the chocolate. Add egg mixture to the butter/chocolate mixture in 3 parts, folding in each time. Most of the erythritol will be at the bottom of the egg mixture, thats ok! Once the wet ingredients are all combined, begin adding the dry ingredients. Add 1/3 of the dry mixture and fold into the wet. Repeat this process 3 times until all of the dry mixture is used and a homogeneous brownie batter is formed. Pour into a greased 8x4 loaf pan. Place into a 325 degree oven for 50-55 minutes. 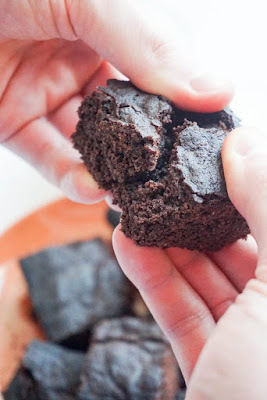 0 Response to "The Best Keto Brownies"